Just up the Golden Horn from the Egyptian Spice Bazaar is Küçük Pazarı, a rarely explored warren of market streets and Ottoman-era caravanserais that are home to scissors sharpeners, saddle shops, vendors selling axle grease (by the vat) and purveyors of axes. From this potpourri of run-down yet extremely photogenic shops, one storefront, decorated with candy canes and Turkish delight, beckons from a distance like a foodie mirage. Welcome to Altan Şekerleme – or, better yet, Candyland. 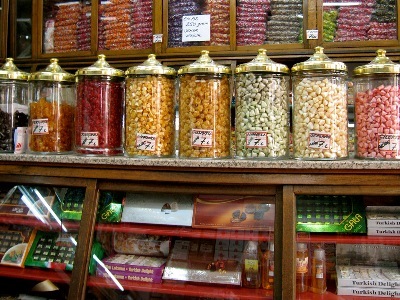 At the airport, Turkish delight, or lokum, may be sold in neat, vacuum-sealed boxes, but in the front window at Altan Şekerleme it is stacked in psychedelic pyramids, laid out into long white rows that are impossibly pink or deep amber on the inside, and even built into little Technicolor log cabins. Feast your eyes on this dreamy sugar-dusted world for a while and prime yourself for the stimulation of the senses that awaits inside.